With a name like Smucker’s®, it has to be good®. Smucker’s® Pure Jams and jellies are made from a blend of sun-ripened fruit, fruit puree and fruit juices. They’re packed with mouthwatering pieces of fruit picked at the peak of perfection. 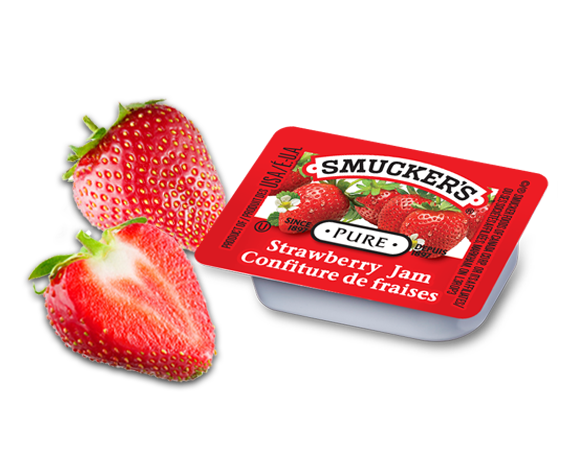 Smucker’s Pure Strawberry Jam is made with a blend of sun-ripened fruit and fruit puree. It is packed with mouth-watering pieces of fruit picked at the peak of perfection. No artificial flavours, colours or preservatives. Ingredients: STRAWBERRIES, GLUCOSE-FRUCTOSE, SUGAR, CITRIC ACID, PECTIN. Smucker’s Pure Raspberry Jam is made with sun-ripened fruit. No artificial flavours, colours or preservatives. Ingredients: RASPBERRIES, SUGAR, GLUCOSE-FRUCTOSE, PECTIN, CITRIC ACID. 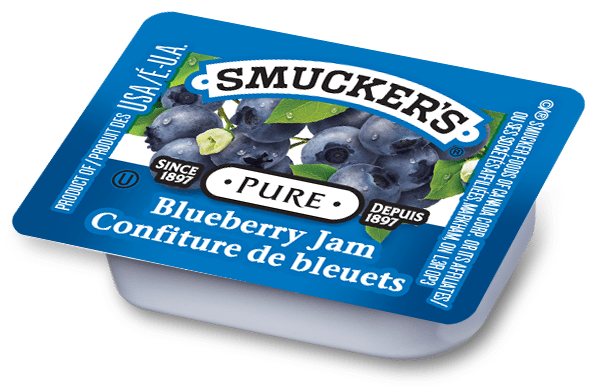 Smucker’s Pure Blueberry Jam is made with a blend of sun-ripened fruit. It is packed with mouth-watering pieces of fruit picked at the peak of perfection. No artificial flavours, colours or preservatives. Ingredients: BLUEBERRIES, SUGAR, GLUCOSE-FRUCTOSE, PECTIN, CITRIC ACID. Smucker’s Pure Grape Jelly is made with Concord grape juice. No artificial flavours, colours or preservatives. Ingredients: CONCORD GRAPE JUICE, GLUCOSE-FRUCTOSE, SUGAR, CITRIC ACID, PECTIN. 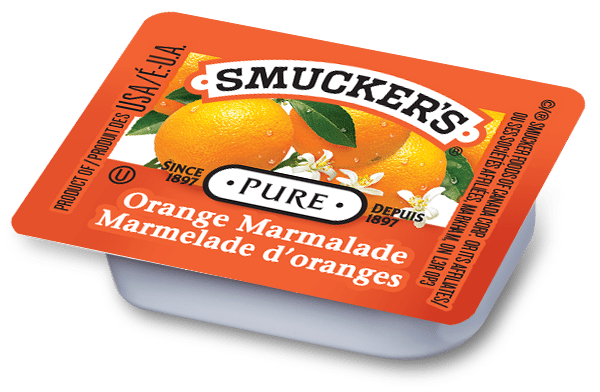 Smucker’s Pure Orange Marmalade is made with a orange peel and concentrated orange juice. It is packed with mouth-watering pieces of fruit picked at the peak of perfection. No artificial flavours, colours or preservatives. Ingredients: SUGAR/GLUCOSE-FRUCTOSE, ORANGE PEEL, WATER, CONCENTRATED LEMON JUICE, CONCENTRATED ORANGE JUICE, CITRIC ACID, PECTIN, SODIUM CITRATE. The delicious taste your guests crave with no added sugar. 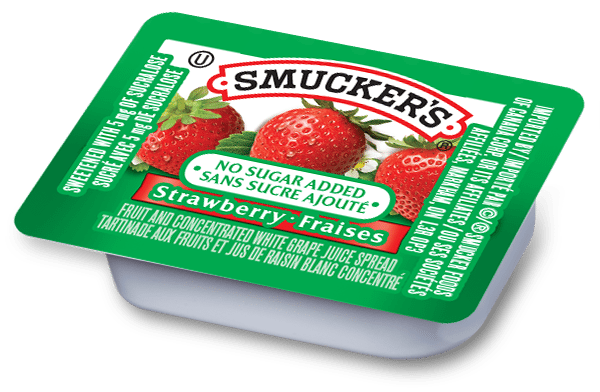 Smucker’s No Sugar Added Strawberry Spread is sweetened with concentrated white grape juice and sucralose. Ingredients: STRAWBERRIES, CONCENTRATED WHITE GRAPE JUICE, WATER, PECTIN, GUAR GUM, CITRIC ACID, POTASSIUM SORBATE, CALCIUM CHLORIDE, SUCRALOSE (5 mg PER SERVING), COLOUR. The delicious taste your guests crave with no added sugar. 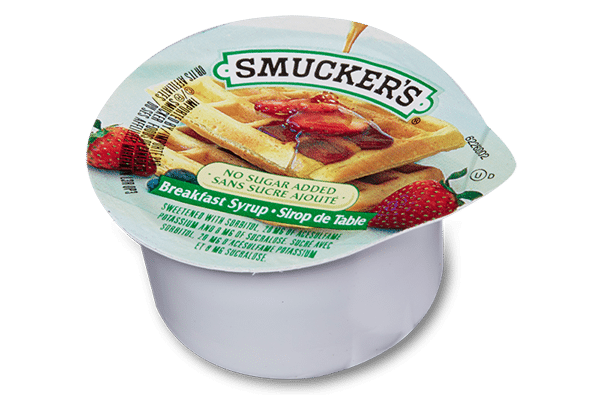 Smucker’s No Sugar Added Orange Spread is sweetened with concentrated white grape juice and sucralose. Ingredients: RECONSTITUTED ORANGE JUICE AND PEEL, CONCENTRATED WHITE GRAPE JUICE, WATER, PECTIN, CITRIC ACID, GUAR GUM, POTASSIUM SORBATE, SUCRALOSE (5 mg PER SERVING), CALCIUM CHLORIDE, NATURAL FLAVOUR, COLOUR (CONTAINS TARTRAZINE). Sometimes breakfast can be a decadent affair, but you can always brighten things up with Smucker’s No Sugar Added Breakfast Syrup. No sugar added, this syrup is sweetened with acesulfame potassium, sucralose and sorbitol. Ingredients: WATER, SORBITOL, CELLULOSE GUM, SALT, NATURAL AND ARTIFICIAL FLAVOUR, COLOUR, XANTHAN GUM, SORBIC ACID, ACESULFAME POTASSIUM, SODIUM HEXAMETAPHOSPHATE, PHOSPHORIC ACID, SODIUM BENZOATE, SUCRALOSE. 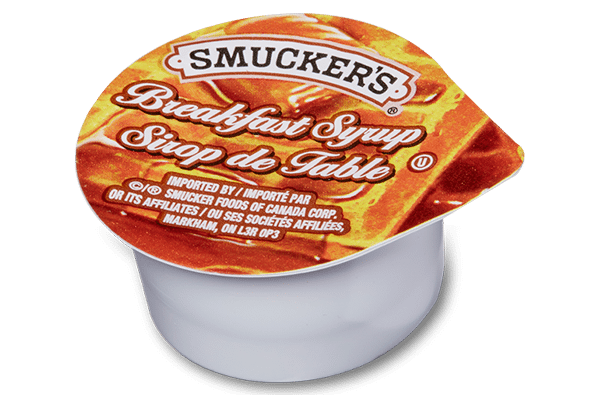 Smucker’s Breakfast Syrup in the perfect portion size for your restaurant. Ingredients: GLUCOSE-FRUCTOSE, WATER, SALT, COLOUR, NATURAL AND ARTIFICIAL FLAVOUR. 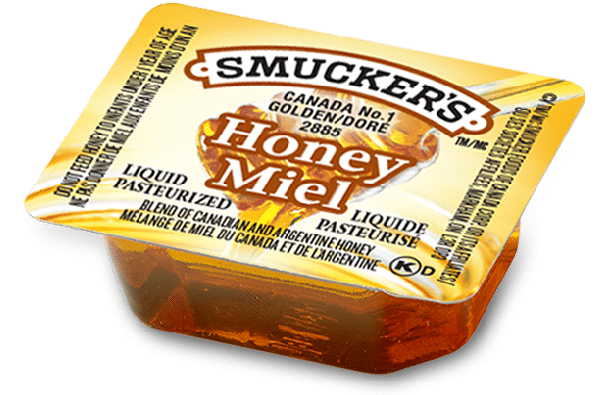 When you offer Smucker’s Honey, your patrons know quality is your top priority.